The term ‘seminar’ is a broad one – the Cambridge Dictionary, for instance, simply defines it as “an occasion when a teacher or expert and a group of people meet to study and discuss something”. This means that if you are reading this article with a view to booking an elegant and luxurious venue for your own working-day, your requirements may greatly differ from even many other individuals, groups, institutions or businesses. 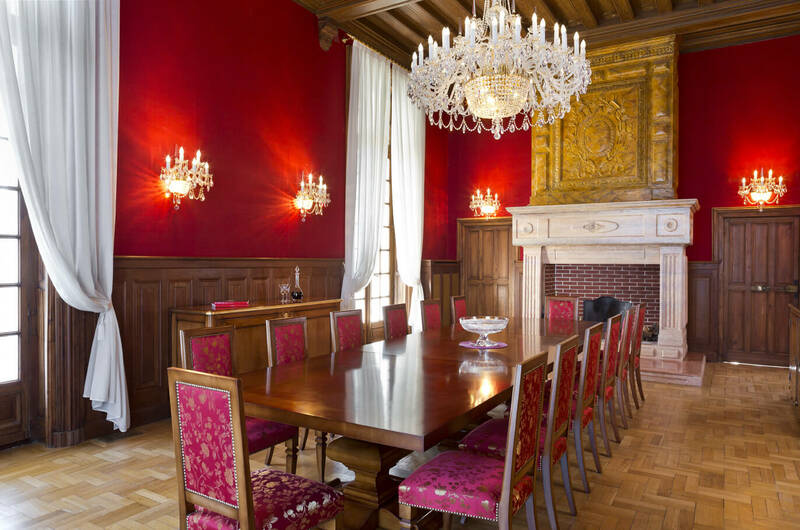 Nonetheless, the following are the most important broad steps that you can take to organise a seminar at the enchanting stone-built residence that is Château Bouffémont, and even more crucially than that, ensure that it is a success. Why are you holding a seminar at all? Long before you scrutinise or compare any venues, you should answer all of the most basic questions that will drive your seminar’s sense of purpose. What will be the subject of the seminar, and who do you expect to attend? What will motivate these people to attend, and how does this relate to your stated agenda for the day? Your answers to the above questions will also influence your choice of seminar venue. Château Bouffémont is so popular as a venue for such an event largely because it covers so many of the obvious bases that need to be covered. With its refined interior decor, crystal chandeliers and spectacular manicured French gardens, Château Bouffémont is sure to impress your guests. However, it also caters to the full range of practical priorities that those holding a seminar frequently have. The venue boasts five 300m2 conference rooms from which to choose for your seminar. Its location also makes great sense – it is situated only 30km from the centre of Paris, and 20 minutes from Charles de Gaulle Airport. This means that your guests should be able to easily reach your seminar – even those who are travelling from the other side of the globe. We mentioned international guests above, and if you have many such guests and are intending to hold your seminar over several days, you may be especially interested in booking a venue that can serve as overnight accommodation for your most important attendees. Those to whom we provide the hospitality of an overnight stay here at Château Bouffémont can certainly expect to be treated like very important people. Our extremely exclusive residence accommodates up to 27 people in the utmost opulence across nine suites and rooms, providing them with an exceptional experience that they are sure to always associate with your company or brand. However, there are also many other practical necessities that you will have to consider, including what date will be most convenient and suitable for your seminar, not to mention available as far as your chosen venue is concerned. How will you market the seminar, and what will be the food and beverage requirements? Again, Château Bouffémont makes a great amount of sense from the latter perspective, as organisations booking the entire building can have access to our whole equipped guest kitchen on a 24-hours-a-day basis. Furthermore, our conference rooms are also able to accommodate 250 people for cocktail dinners. Bear in mind that you don’t necessarily need to do the catering for your seminar yourself, as we can also provide our own dining services throughout the day, organising all of the details of a lunch pause or dinner that will fully satisfy the varied appetites of your attendees. Finally, you will also benefit from the very highest standard of business equipment when you choose Château Bouffémont for your seminar, with such essentials as Wi-Fi, a projector, scanner and printer all present and correct. We also have a full complement of staff on hand who can assist you with the use of such equipment. Why place your trust in any other seminar venue? There’s much else that can be said about how to plan a seminar that will be met with success – indeed, this complete guide from LexisClick could be helpful towards that goal. But if, like so many others to have held seminars, conferences and other private events with Château Bouffémont previously, you have already fallen in love with this venue, you only need to contact our team now to learn more about how you can take advantage of our exquisite venue.